We were up for an unusually early start today, up at 6:30 in order to get checked out and off to the bus station for our trip to Abu Dhabi. Abu Dhabi is about 150 km from Dubai, and it seemed like the cheapest and easiest way to get there was by intercity bus from the main bus terminal. So after getting checked out, we hopped in a taxi over to the bus station. It was as easy as advertised - 25D (about $6-7) each way for the trip. After buying our tickets, we went into a local restaurant and had some breakfast - Indian food for breakfast was a first for both of us. After that, we hopped on the bus and we were on our way. The trip was pretty easy, and within two hours we were pulling into the main bus station in Abu Dhabi. From there it was a 10 minute cab trip to our hotel, Le Meridian. Sadly, that's where our well intended plans fell of the rails a little bit. As it was only just before 11, our hotel room was not ready. So we decided to wait for a bit and see if it came ready. We headed down to the poolside and lounged by the pool for a while. The hotel is really a full beach resort, with a small private beach and a series of restaurants, bars and a nightclub. 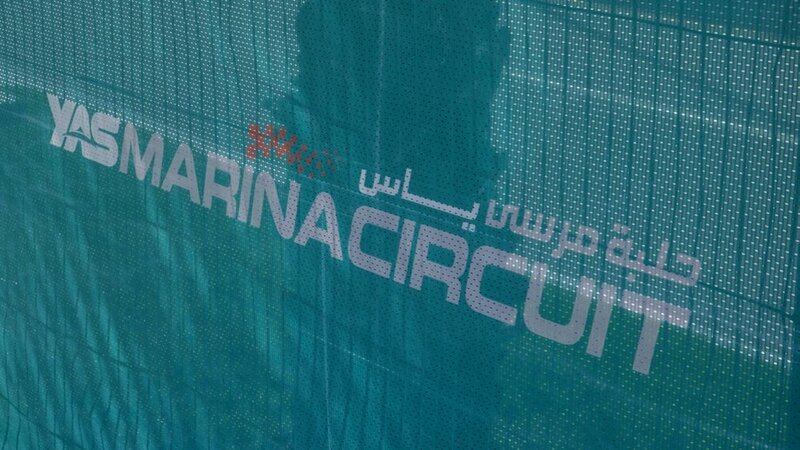 After about an hour we gave and waiting for our room, dropped our luggage with the baggage guys and booked a car out to the Yas Marina Circuit for our first day of Formula 1 excitement! One thing we've quickly realized is that the Circuit is a long way from downtown. It's about a 25 minute cab ride out there, and there's no real public transit options. It's going to make getting out and back interesting. One of the many cars on display at the race. We ended up booking a private car to get out - about twice the price, but we ended up sharing with a British couple that was going out as well. They were nice and we chatted the whole way out. The car dropped us off at the West entrance, and soon we were making our way in through security (pretty well handled) and into the race circuit! 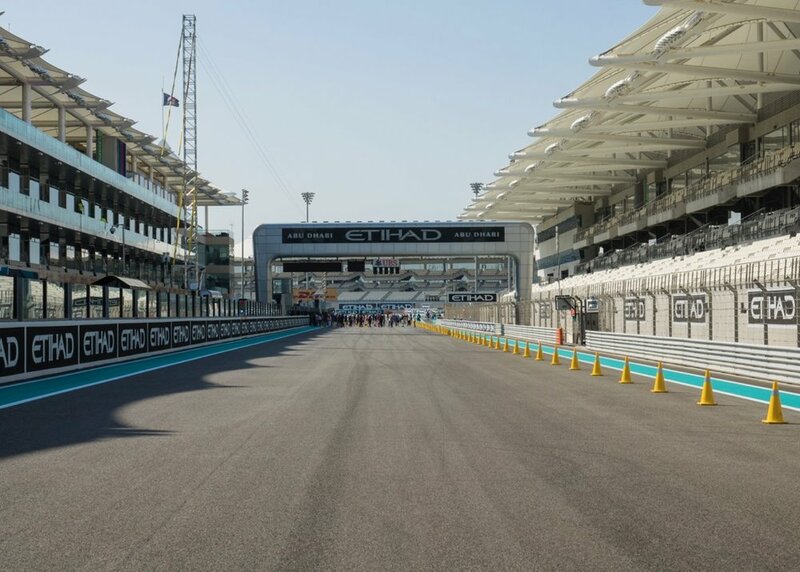 The way the track is set-up, there are a series of grandstands around the course. 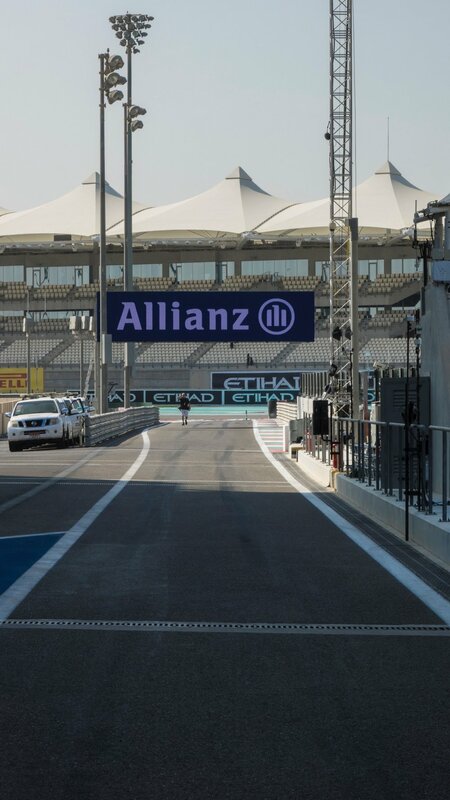 For our race day tickets, we're in the South Grandstand, but for this first day where we were going to walk out onto the track and through the pit lane, this entrance worked just fine. There are "Oasis" at each of the grandstands, with food, bars and entertainment going on. They seem pretty well organized and set-up. 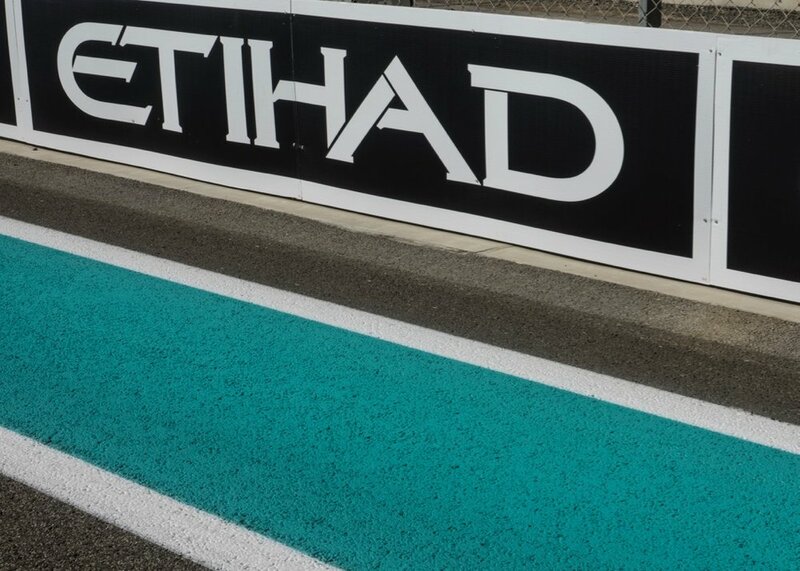 We immediately headed out to the pit lane walk, and stepped out onto the racetrack in Abu Dhabi! 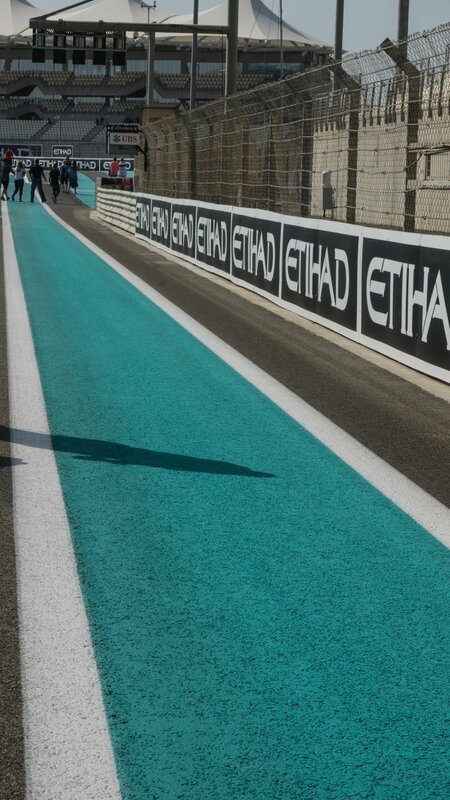 It was pretty cool, walking through the pit lane straight away. We took a bunch of pictures on the race track, then headed into the pit lane. We were able to walk along where the cars go in and out of their pits. Out on the track between the main grand stands, on the main straight away. There were cars in most of the pits, with most of them being completely apart in pieces. It was pretty cool to see. There were a couple of cars that were completely put together, and were being taken in and out to some other location. 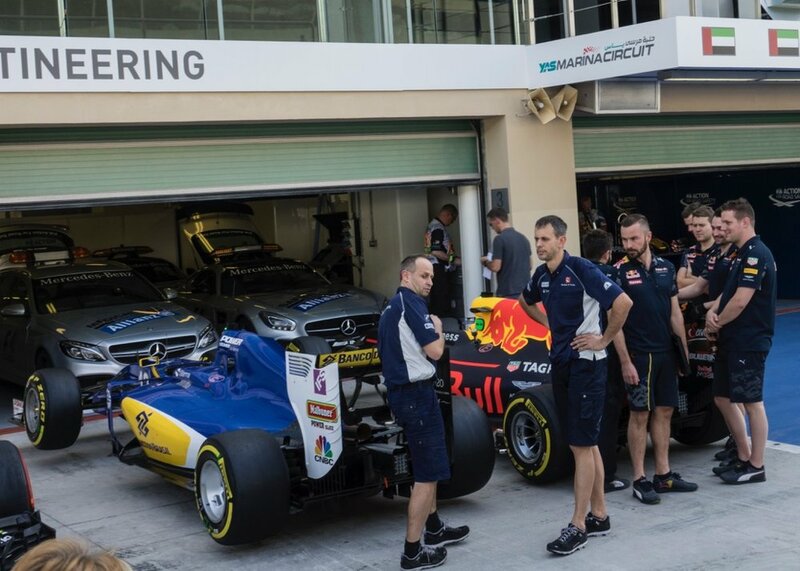 We walked past all of the teams, and had a look at each of the garages. It's an amazing set-up they have. Each of these teams has one of these stations where they monitor their cars during the race. Most were set-up to display interesting information for fans as we walked by to check things out. Replacement front wings for the Haas cars. Sets of tires from the Mclaren Honda team. One of the Sauber cars, completely pulled apart. Working on one of the Renaults. Close up of one of the Renault cars, pulled apart. After the pit lane walk we ended up in one of the villages and grabbed some food. Expensive as you would imagine, but we knew that going in. From there we headed back out of the Circuit, and hopped on one of the local buses to go over to check out Ferrari World. Ferrari world is, as the name suggests, a Ferrari-inspired Theme Park, complete with rides and games and displays of Ferrari vehicles. The place is huge, and we had seen mixed reviews on if it was worth visiting. They claim the world's fastest roller coaster, and since we were there and this was our least busy day of the four, we should check it out. 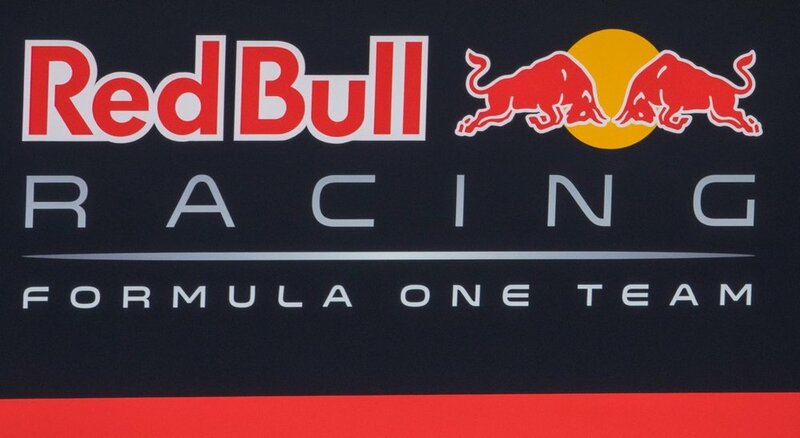 Ricciardo's Red Bull, minus the tires. Lewis Hamilton's car - or most of it anyway. 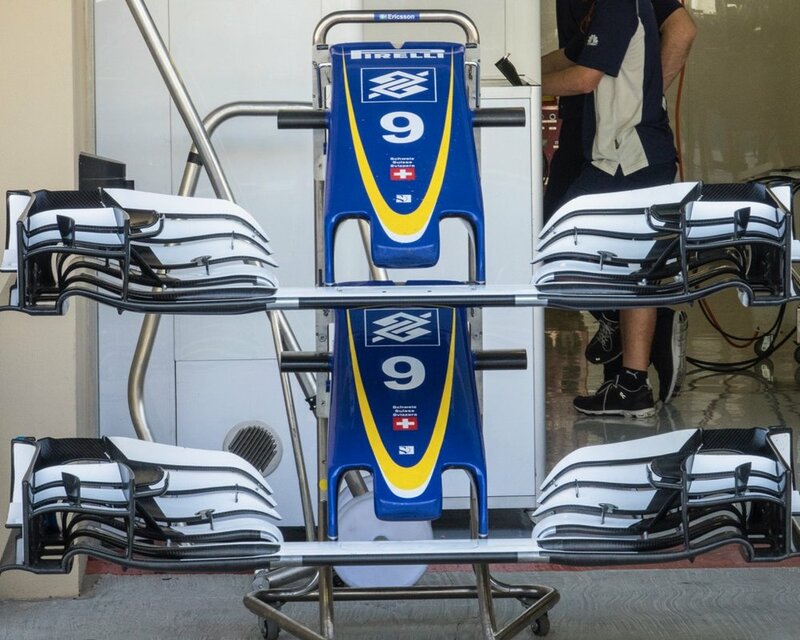 One of the Williams cars. The starting grid. Each of the cars will line up in one of these white boxes. Justine out on the track in the starting blocks. 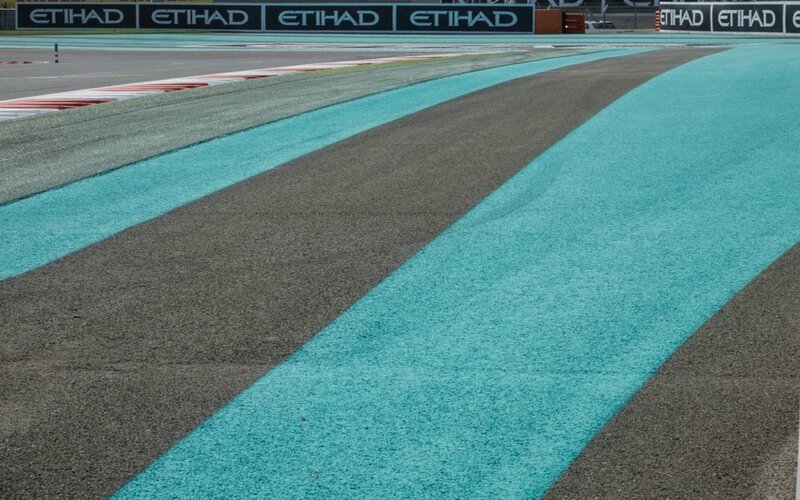 The distinctive turquoise colour of the track lines at the Abu Dhabi Grand Prix. Our tickets for the race got us into the park for free, which was a nice benefit. It was surprisingly quiet when we got inside, and headed straight for Formula Rossa. Formula Rossa is the world's fastest roller coaster, with a top speed of 239 km/h (149 mph). The coaster train accelerates to its top speed in approximately 5 (4.9) seconds. The initial acceleration from standstill reaches 100 kilometres per hour (62 mph) in 2 seconds, and riders experience up to 1.7 G's of force during acceleration and up to 4.8 G's throughout the ride. The roller coaster track is 2.2 km (1.4 mi) in length, ranking it 6th in the world for steel roller coasters. Formula Rossa starting point - you accelerate straight out to 240 km/h. A sense of the scale of the place. It's just huge! The line up wasn't bad - we ended up waiting about 30 minutes. We had heard stories of 4 hour wait times in the park, so we weren't complaining. The ride was pretty wild - the start is a straight line acceleration that is something crazy to experience. The ride was over very fast, but it was really fun and well worth the short wait. From there we headed over to the second roller coaster - Flying Aces. This one is know for having the world's tallest on-inverting loop. Styled around biplanes, this one ended up being the most fun coaster in the park. It immediately accelerates you up this huge hill, before dropping you what feels like straight down and into a massive loop. This one felt about twice as long as the first coaster and was an absolute blast. As there was almost no line at all, we ended up riding it three times! It was super fun, especially on the outside seats where there's no floor under your feet. Super fun especially when there was no line! And the big loop. Such a fun roller coaster! We then took a short break before doing the last small coaster when he was better than it looked like it was going to be. We also wandered through a small show room of designer vehicles, then did a simulator that was pretty bad. It was actually starting to get busy as we left the park at around 7 p.m. It was worth the visit, but i would never bother with it if it was busy. We got a taxi pretty easily, and headed back to the hotel were we had dinner at one of the restaurants in the resort. It was a good start to our Formula 1 inspired trip!